Happy Monday everyone! Here’s a look at what I wore over the weekend heading to dinner with Drew. If you follow me on Instagram (@rachparcell) you’ve seen this pretty little bag on repeat A TON lately! There’s a story behind this bag that I need to tell all of you about but I’m going to save it for a later post. It’s too long to type right now, it’s 1 am and this mama needs to get to bed! Isla’s been sick the last few days so I’ve got to catch up on some sleep! Hope you all had a lovely weekend, thanks so much for stopping by!! what a chic and lovely denim dress! Hi Pia!! Thank you so much! Its perfect for summer time! Amazing casual chic! Adorable dress and obsessed with the shoes! Have become this happy, busy and with new responsabilities mother of Isla and the baby boy to come. As a mother of a 24 and 21 year old, I can clearly say that you are a mature young woman and your parents must be so proud of you. Kattia Thank you so much for those kind words!! I must say being a mom is busy, but seriously the best thing ever and Dash and Isla love each other so much that it works out perfect!! I LOVE that dress!! J.Crew always has the best staple pieces. Fun accessories too. Love the outfit! Great picks. Love the look! Great Karen Walker glasses! Love your Chanel bag!!! I don’t see that many in white come around. Beautiful details! Thank you so much Rochelle! I know I love the white color. I link so similar bags below! 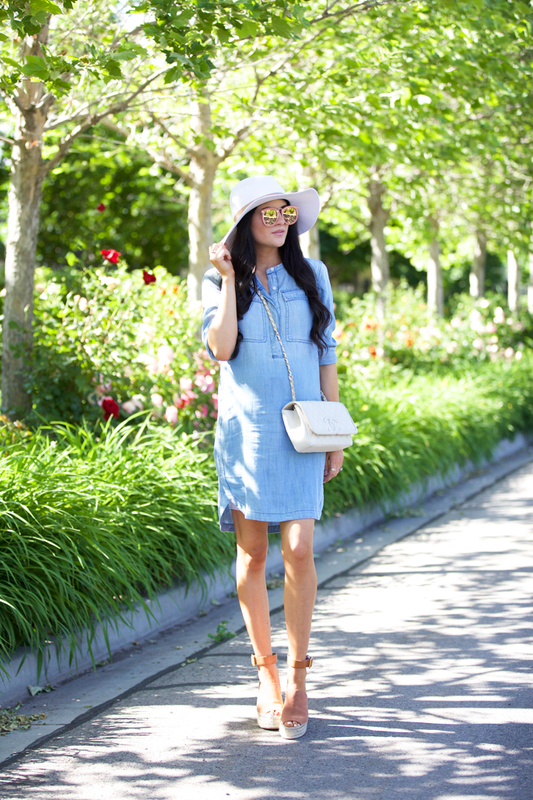 Love a chambray dress and yours is spot on! It pairs so well with the platform espadrilles! That outfit is very simple yet gorgeous. Love it!!! Such a perfect weekend look! I love that bag! It’s amazing! and Mr. Dash looks so handsome! I love that dress! It goes perfectly with your purse! Rachel, this dress looks so effortlessly chic on you. I tried it on a couple of months ago but it just didn’t fit right for me but glad to see you liked it too and wear it great, it’s such an easy and comfortable piece for summer. Maria its really so comfortable! And it’s so easy to wear and you can dress it up or down! Such a cute dress! I have a similar one I found at TJ Maxx! What a beautiful outfit. We really like your style! 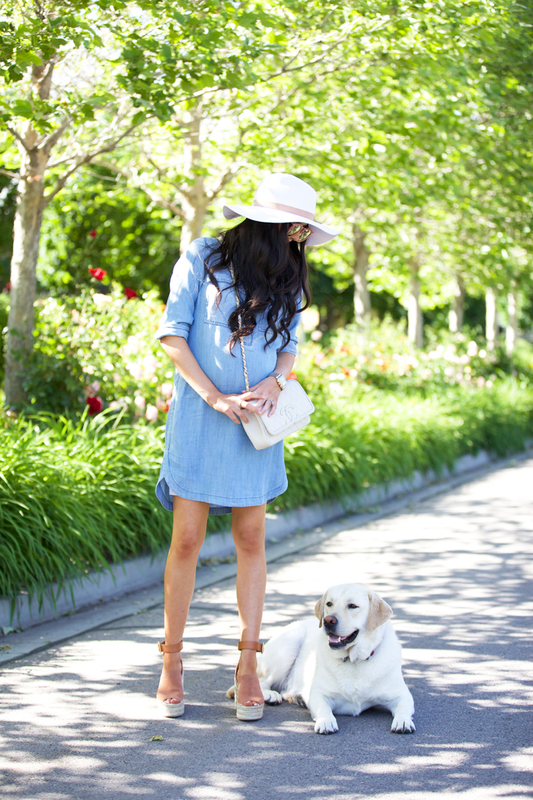 Such a cute chambray dress! Such a great little bag, and I love this whole look! looking fabulous as usual!! Excited to hear about your story! Have a lovely day! You look so pretty, Love the dress and the bag <3 I hope you are having a wonderful week! Adore this look. That dress is so cute. Love the hat too! Love how laid back yet pulled together this look is! Perfect! Lovin’ this casual look! Hope Isla feels better too. Thank you so much Rachel! I know its been a rough week for her, but she is getting there! Gosh that Rag and bone hat looks so cheap for the price. It looks so floppy and cheap. So disappointed. Cute and perfect day time look! 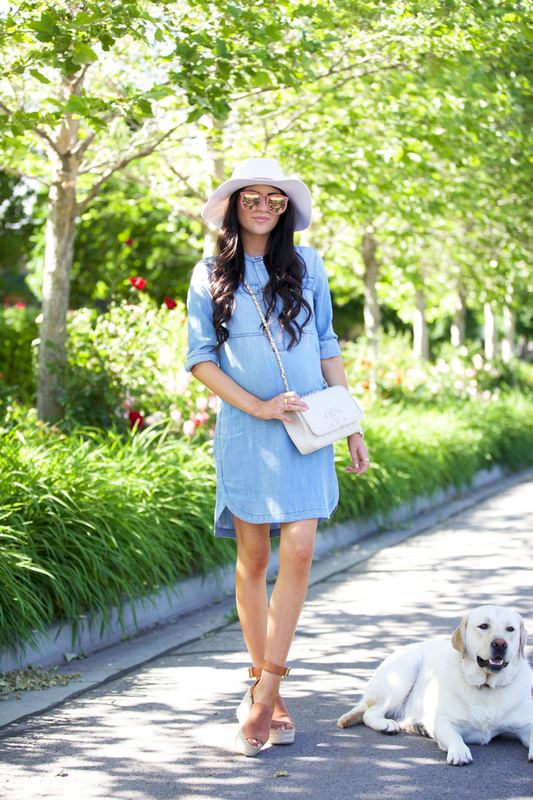 What a cute chambray dress!! Love the color! Oh my gosh thank you so much Summer! You are too sweet! 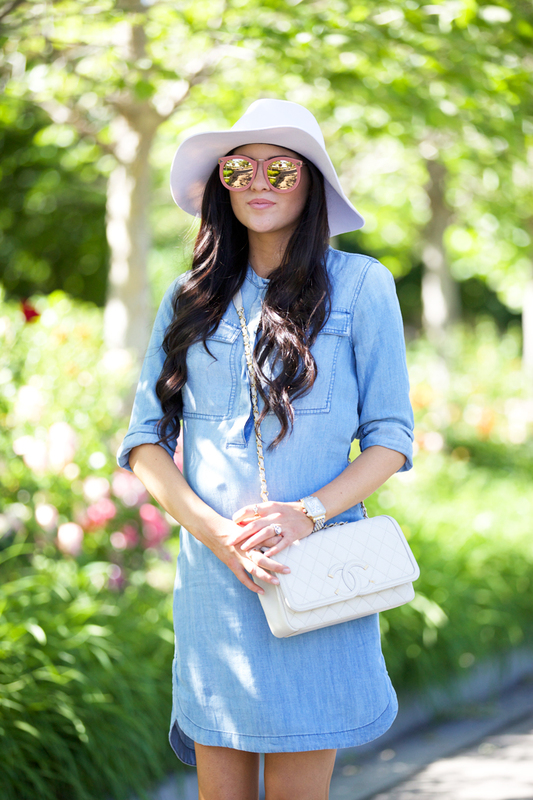 I love the chic simplicity of a denim dress! Drooling over this look! Your style is my daily inspiration I love the simplicity and functionality! And you’re the cutest preggo mama out there! It’s seriously the cutest and so comfortable Kyndel! You would love it!! You look so beautiful, your sunglasses are amazing ! I love your shoes! They’re such a pretty color! This dress is beautiful! The colour is perfect! I really need to get a chambray dress! This is so cute. Love the sunglasses, too. Ohh you look so pretty!!! 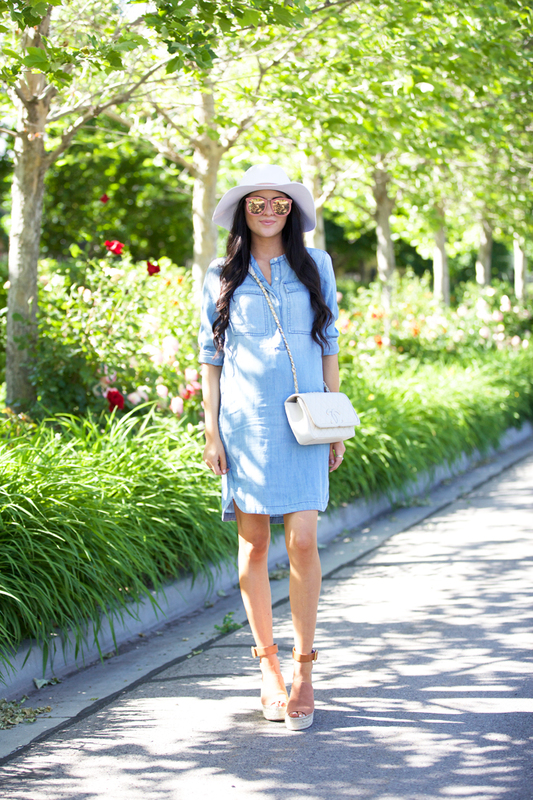 <3 Love this denim dress, so perfect for summer! P.s Dasher is sooo cute!!! You look so pretty!! Love the denim. Beautiful look!! I am adding that dress to my wish list! What do you wear under your dresses for extra coverage? It looks like you have shorts on under your dress. I’d love to know as I feel like all of my spandex shorts aren’t the most smoothe or comfortable under dresses and as a mom to two, having a little extra coverage is key! I’m glad to see you like to balance impractical by cute fashions, like the shoes, with practical options like the shorts! It’s so relatable!